Saturday I was on the F train for exactly 1 hour and 40 minutes, just to fill my curiosity and keep my taste buds entertained. 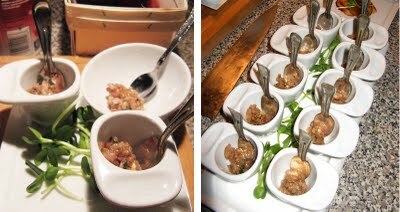 This is my second Supper Club dinner experience, thanks to my friend Yvonne, who’s the author of the blog underground dining. She raved about her first experience with this Brooklyn Edible Social Club (five course dinners parties for about 12 guests), and since she lives for these events, I trusted her. I’m not too familiar with Brooklyn, but somewhere around Prospect Leffers Gardens, we entered a gate then another door into an apartment building, and finally into a lovely apartment. Warmly greeted by the hosts, the chef himself Andres and his lovely girlfriend, who made our cocktail of the night, whiskey and apple cider. Both were so friendly and inviting, I felt at home, and they were like the long lost friends I’ve never met. Andres has a impressive list of restaurants and experiences under his apron, from French Laundry in Napa Valley to Gordon Ramsay, a world traveler and a fine artist when he’s not in the kitchen. Here he’s preparing our food, using fresh local ingredients in every course, while we’re all chatting away in the fragrant dining room. 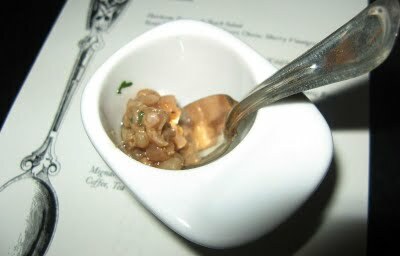 Amuse Bouche, a mackerel tartare, I’m not a big mackerel fan, unless is grilled or pan fried, but it had good flavors. 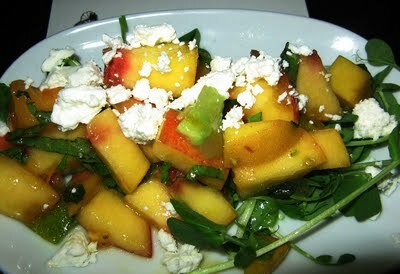 As the chef put it best, this was our last taste of summer, Heirloom Tomato & Peach Salad. I love that the basil actually came from his little garden (on his balcony where he also grows tomato and peppers) and directly to our plate. Fresh taste of mint and basil, sweet and meaty tomato and peach, with a drizzle of sherry vinaigrette, sitting on top of a crisp wild purslane salad. One of my favorites of the night came in the form of a Sweet Corn Veloute (sweet corn cooked with butter and heavy cream), a thick, comforting, blend of smooth corn, soupy heaven. Sweetly enhaced by a wildflower honey, and contrasted nicely with salty hooligan cheese and spices from the pumpernickel croutons. 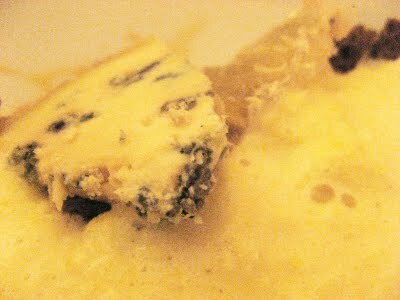 I don’t usually eat blue cheese, but this just paired so nicely, I wanted to hug the bowl, literally. 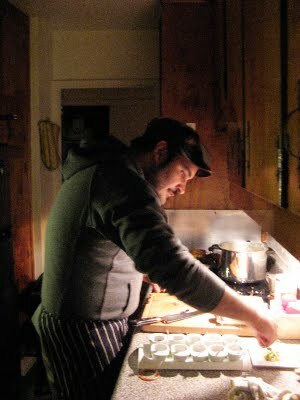 Andres was generous enough to pour some extra corn veloute into my bowl, bless him! It was sooo unforgettably good. The Mackerelwas cooked perfectly with a crispy skin, and paired with chickpea and kale which were cooked in bacon and had soaked up all the flavor from da’ fat, it reminded me how great chickpeas and kale (both very tender) could be when you know what you’re doing. There also was spoonful of fluffy aromatic rice and a fire-roasted red pepper vinaigrette to finish it off. 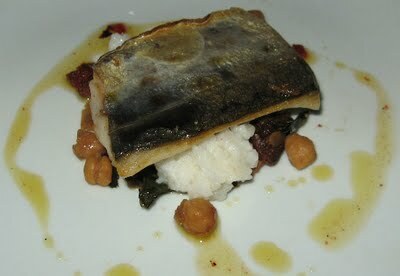 Very well balanced dish, I enjoyed every bite. The Seared Moulard Duck Magret (it’s a fattier, more flavorful and meatier duck breast, these types of ducks produce foie gras). 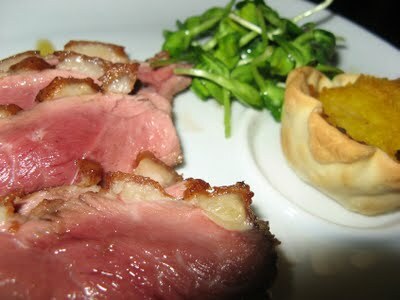 Seared till it had a nice brown color and crispy skin, with very tender and juicy rare meat, brushed by a chipotle and maple jus, a good play of savory, sweet and spicy. I love anything chipotle. Also on the plate, a sweet roasted squash tartine, and sunflower sprouts salad, I’ve never had them, these baby sunflowers were fresh and had a spicy taste, think radish, I really liked them in the tangy dressing. Dessert was a Matsuma Plum Pie, and a tiny cup of Ginger-infused Hot Chocolate. 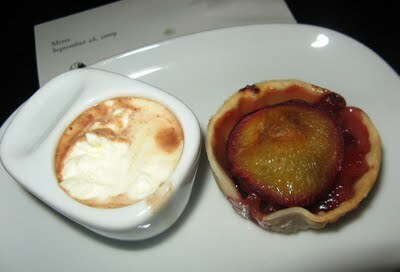 The pie was a bit too tart for me, but the fresh plum really stood out. A tiny cup of that aromatic hot chocolate was not enough, I would of liked a whole cup. It had a light chocolate and milk mixture, with the spicy ginger in the background, great for a cold winter day while your cuddle in your new snuggies, just kidding, unless you really do own them (laughing hysterically), but as for me I’ll be in my Nap Dream blanket. By now, it’s midnight, we arrived around 8pm, and tea and coffee was being served, along side apple cider donuts, I guess time does flies when your having a delicious meal, 2 desserts in one night, great conversation and interesting people. This was sure worth my trek to the other borough. Thanks Cindy, I'm really happy you guys enjoy the dinner. You are more than welcome every time to my house, seriously. Great meeting you Cindy! Hope to see you soon at another food event!!! Was lurking here for a while. This seems a nice forum with a lot of valuable information. Just decided to register and say hi to everybody.